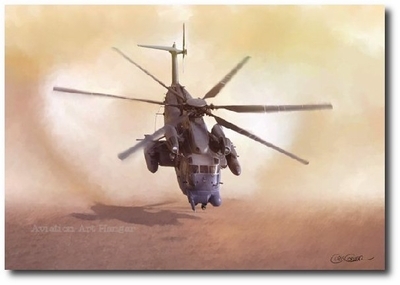 Overall size 15" x 20"
Image size 12 1/2" x 18"
Overall size 20 1/2" x 28"
Image size 18" x 26"
The MH-53J Pave Low III heavy-lift helicopter is the largest, most powerful and technologically advanced helicopter in the Air Force inventory. The terrain-following and terrain-avoidance radar, forward-looking infrared sensor, inertial navigation system with global positioning system, along with a projected map display enable the crew to follow terrain contours and avoid obstacles, making low-level penetration possible. Executing a high performance take off, the MH-53J Pave Low III creates a massive dust storm covering its egress from possible hostile small arms fire. 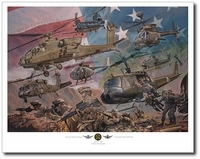 Chris Cosner's latest painting pays tribute to The U.S. Air Force's legendary Pave Low Helicopter. Both powerful and versatile, the Pave Low is called upon for some of the most important and dangerous missions the U.S. Military encounters. Available in two sizes ready to frame.